ABOVE: Tailgaters at the Air Force Academy don't mess around - only Spanish Jack's would do for their ribs and chicken - grilled in the shadow of "Sherry Baby" - their Deuce & 1/2 Vietnam Era troop carrier spirit wagon. Thank you Brian, Roberta and USAFA alumni for letting us and Spanish Jack's be a part of your game day! "For a mail delayed birthday present, I'm thrilled to have received my Ambassador Emeritus status from Spanish Jack's. I'm humbled and honored to have received such recognition. The road has been hard fought through grilling at -30 F and driving snow storms. But, I persevered, even with snow filled crocs. Thank you Spanish Jack's. I hope I can continue to prove myself worthy even after returning to the Mother Ship this summer. Now I'm hungry for ribs!" 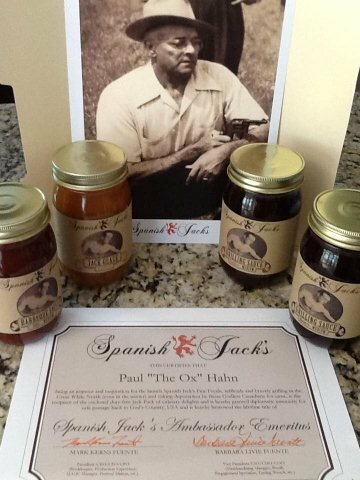 Note to SJ friends - to the left is a shot of Paul's award, plus SJ products and a picture of the original Spanish Jack, Joaquin de la Fuente, the Spanish Red Devil. We wouldn't mess with him, would you?! "Had a party with my employees last night. Cooked 2 extra racks of pork ribs so I could have some for lunches this week. When the party was all over, all I had left was dirty dishes! Everyone grabbed a plate of ribs to take home and left the boss with squat. I guess the taste of the Spanish Jack's is a blessing and a curse - guests left happy, host goes hungry. Thanks for making my party a success." "We had the most amazing and easy grilled chicken with your cranberry grilling sauce last night! Have you tried it with salmon?" "I’ve encountered countless sauces and marinades, but recently experienced a stellar new taste sensation. 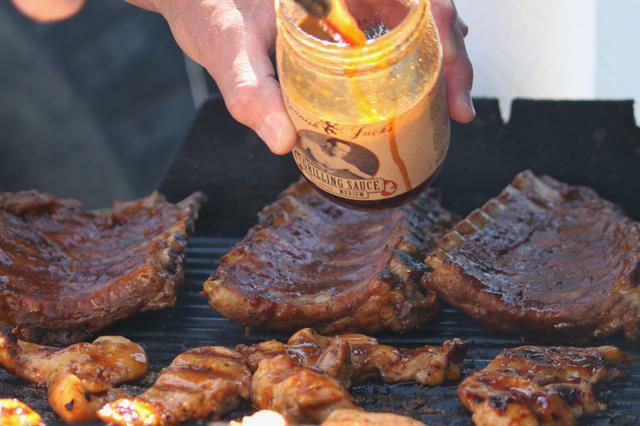 Spanish Jack’s has created a grilling sauce that hits the mark for when one desires to boost the flavor of steak, chicken or pork. As someone who grills two to three times a week, I am constantly in pursuit of something different – yet not too far over the top and Jack’s meets that criteria. This is a taste that takes one on an exciting ride of flavor complexity, yet brings you back home eager for another ride." "Both Jack's barbeque sauce and grilling sauce were FANTASTIC on the pork chops I grilled last night. I might start brushing my teeth with that stuff." "They can pour lemon juice on my paper cuts. Hang me by my toe nails. Tie me to a chair and force me to watch “Alf” reruns. Make me eat Brussels sprouts. Give me noogies until I cry UNCLE!!! Tickle me till I wet my pants. Give me Indian burns on my arm. Drag me around the house by my ear. Thump my head with a thimble. Give me swats with dad's old belt. But I promise you that I will never, ever, ever, under any circumstances reveal the genius that is behind your sauce. Besides, it is just like Hacksaw Jim Dugan once said…'You can tug on Superman's cape, you can spit into the wind…but you never piss off the ghost of a Spanish Wrestler!!!' Something like that anyway….I promise your secret is safe." "My pork tenderloin last weekend was split Jack's Cranberry and Blueberry Grilling Sauces - I can't say I prefer one over the other. They were both AWESOME!" "Are you freakin' kidding me? Where have these sauces been all of my grilling life? The Cranberry Grilling Sauce had just the right amount of 'oo-dang-tang' to make my taste buds jump up and dance. I would have stood up to clap, but I was afraid someone would steal my plate." "Sending pics of the chicken cooked with the Barbeque Sauces (Coffee) and Grilling Sauce (Cranberry) on Labor Day...my daughter loved the BBQ sauce! She said it was just the right mix of sweet and spicy. The Grilling Sauce was excellent also - I marinated the chicken for a few hours before grilling and then recommend not being stingy on the final basting when you're almost ready to take it off the grill...the more the better!" "I know you don’t want me to write and tell you 'what you want to hear', but I am going to anyways. I have tried every sauce that you have made, I do believe, mostly from Luke (SJ's great-grandson and Spanish Jack's Ambassador) making me. I am not a big spice guy, so I tend to stray away from the really hot stuff. However, my favorites ended up being the Blueberry and Cranberry hot versions. Now back to the latest creation - Mango. 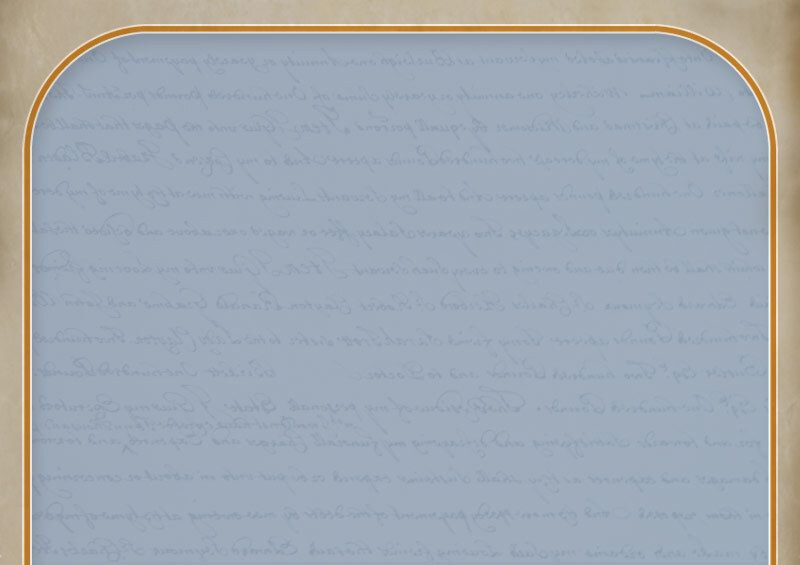 It is now at the top of my list. I grilled 2 big salmon fillets the other night. I had some left over the next day, and figured let’s try the Mango sauce. Long story short, I ate one of the entire halves of the fillet, dipping every bite in the Mango sauce. I ate this before Maggie and I were to go to a dinner. I thought I would just take a few bites and be done with it, but that was not the case. You can ask Maggie about this - she'll have a good laugh. I didn’t eat much dinner that night, needless to say. Anyway, I have now had the Mango sauce with Ribs, Chicken, and Pork Chops (last night, and again today at lunch), and obviously - with Salmon. Who would have thought it would be good with Salmon, but it is delicious. Thank you!"